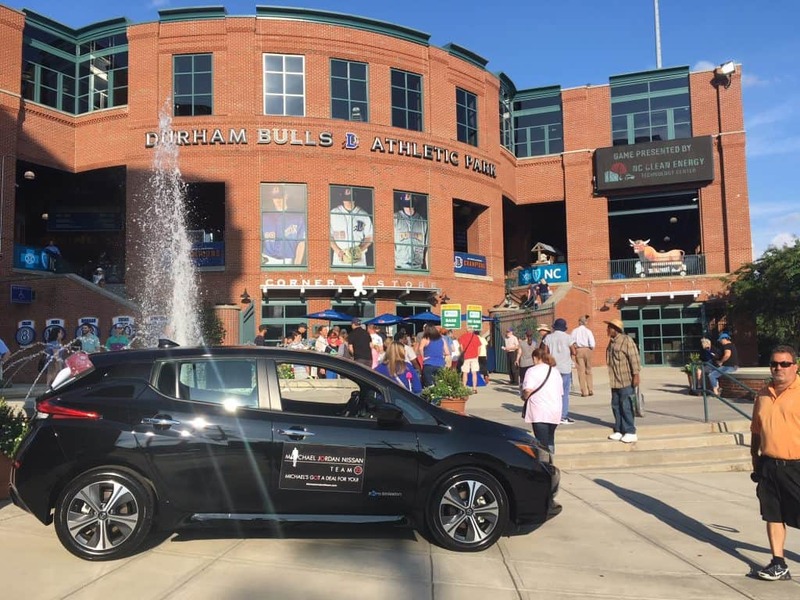 The evening before the 2018 Sustainable Fleet Technology Conference & Expo, the Clean Transportation team at NC Clean Energy Technology Center displayed several plug-in electric and hybrid vehicles outside of the Durham Bulls baseball game on Aug. 21. 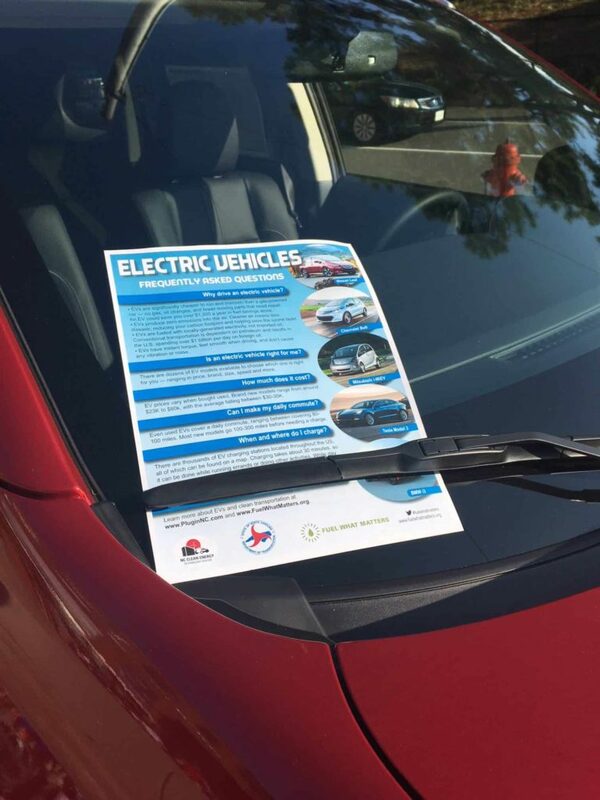 Learn more about electric vehicles by checking out our Electric Vehicles FAQ flyer here. 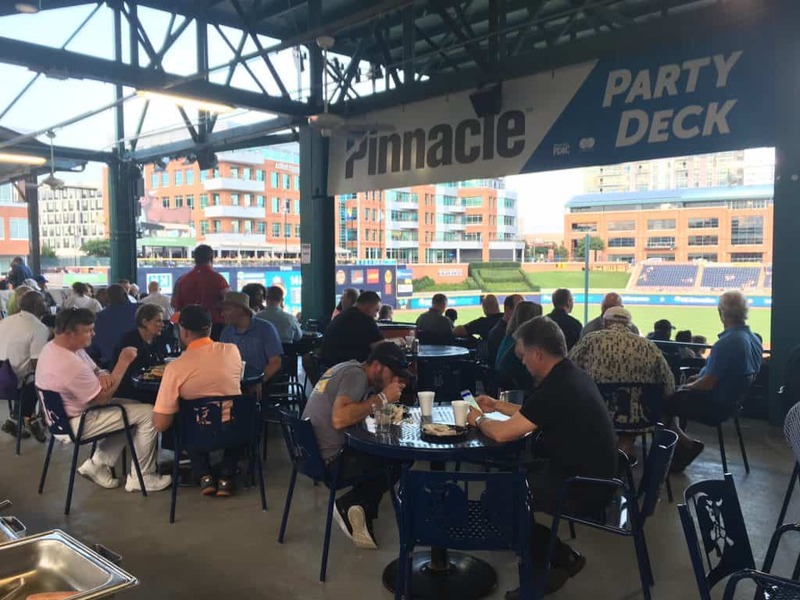 Attendees of the pre-conference events came to watch the game, enjoy networking and eat a barbeque dinner. 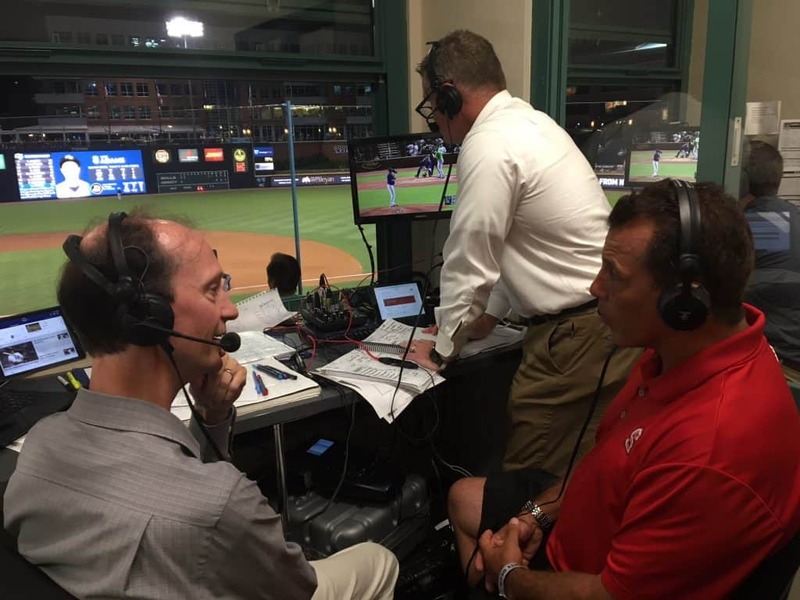 Rick Sapienza, Clean Transportation Director, accepted the game ball on the field and spoke with game announcers in a live radio interview (listen to below)! 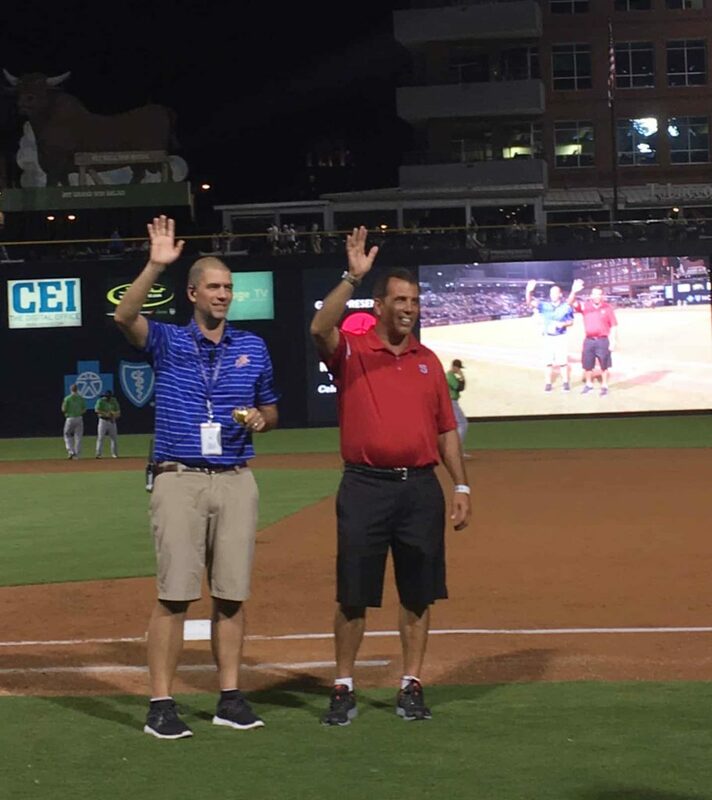 The City of Raleigh has more than 2,000 registered vehicles in its fleet used for a wide variety of services, including the police force, garbage, maintenance and repairs, public utilities, water and sewer and more, according to Fleet Services Superintendent Travis Brown. Along with the wide range of vehicles, Raleigh also has a large number of alternative fuels and alternative vehicles to match. The City, which isn’t new to the 100 Best Fleets list, uses 385 vehicles with B20 biodiesel, over 1,000 E85 flex fuel-compatible vehicles, 223 hybrids, 18 electric powered neighborhood vehicles, 25 vehicles that use propane, and 7 that use natural gas. 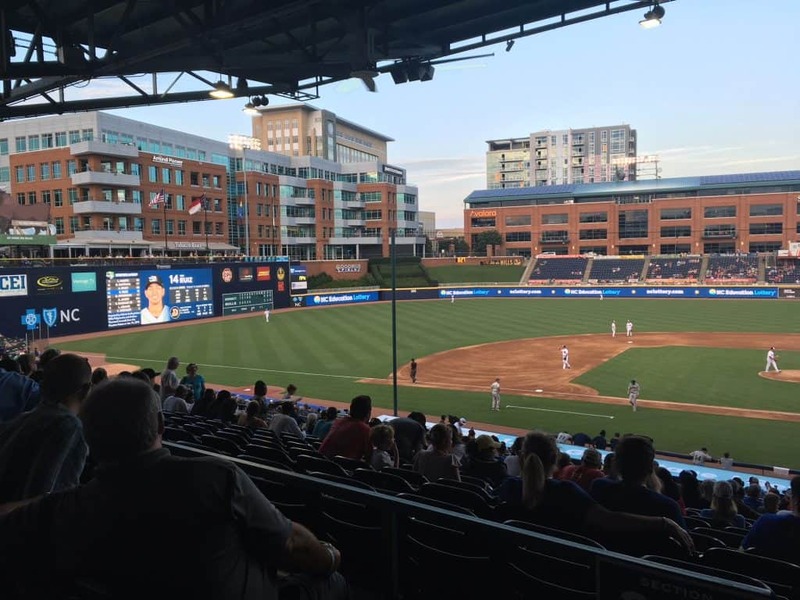 Brown, who has worked with the City of Raleigh for 16 years, said the City has been working to transform the fleet even before he arrived, when the City was already using biodiesel. Brown said that so many alternative fuels have been introduced into the fleet because they help to reduce emissions, improve air quality, promote domestic energy production, help decrease fuel costs, and can help farmers. The goal of the City is to take care of its citizens, Brown said – and using alternative fuels is a part of that. “It’s about being a good steward of a city, and trying to do the right thing,” Brown said. Raleigh also uses anti-idling technology in many of the police fleet vehicles. 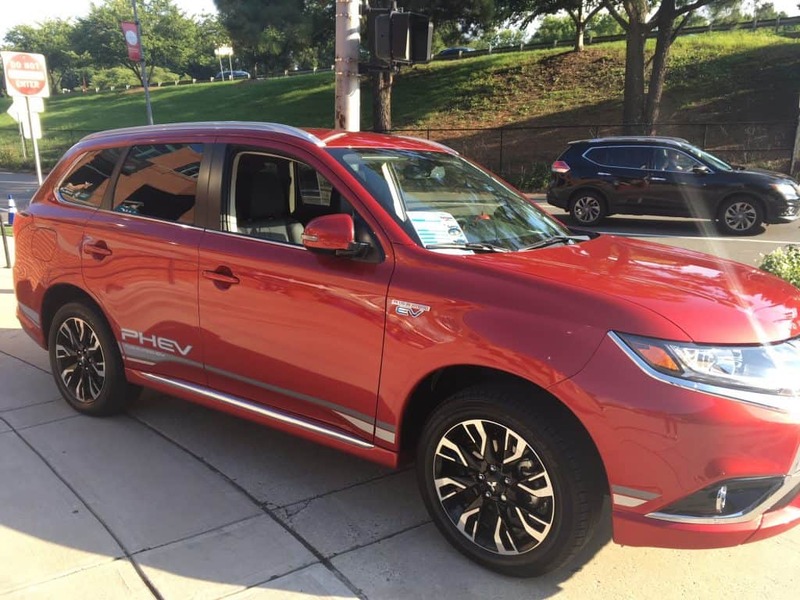 The Energy Xtreme Law Enforcement anti-idling system allows vehicles to operate their full electrical system (including lights, camera and radio) without using the vehicle’s engine, according to the City of Raleigh website. After the first quarter of the anti-idling technology usage, about 962 gallons were saved from 29 vehicles that used it, according to the website. The projected annual savings were estimated at $63,199. Previously, many City police vehicles were driving Ford Crown Victorias, and now they’re driving hybrid sedans – which Brown said saves a lot of money when it comes to fuel. The Crown Victorias were getting around 13-18 miles per gallon (MPG), he said, and the hybrids get around 30-38 MPG. “It’s been a good investment on return, going that way,” Brown said. In addition to alternative fuels, the City schedules vehicle replacements every year to ensure the fleet is kept modern. Raleigh also uses a maintenance management system, which provides GPS information for departments on engine faults, idling, equipment and accountability. The most challenging part of managing a fleet, Brown said, is communicating and educating – getting the word out to all staff about changes and plans, and educating on new ways of doing things and how those changes are beneficial. Brown said he addresses it as much as he can by having meetings with service departments and providing data on fuel usage. When running a fleet, Brown advises doing research, networking with those in the same industry to see what works for their fleet, looking at your own to figure out what could work for yours, and attempting to do some forecasting. Looking ahead, Brown said Raleigh hopes to push more telematics, eventually adding the technology to all vehicles being used. Currently, Raleigh uses a maintenance management system, but the City would like to upgrade to a web-based system so they can provide more transparency to users and customers. 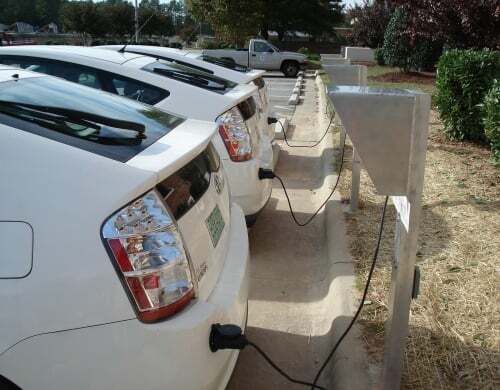 Learn more about the City of Raleigh’s alternative fuel use by visiting the website here.